This recipe sounds fancy. It looks fancy. It tastes fancy. But it’s so darn easy. Which is amazing, since over or under cooking fish is the worst!! If you follow me on Instagram, you might be familiar with our #TacoTuesday tradition. Since we work late on Tuesdays, we need to make something quick for dinner. Lettuce Wrap Taco‘s have been our go-to for years, however with the recent changes in my life (a.k.a. pregnancy) I’ve been doing everything possible to get as much seafood in my diet as I can. EPA & DHA have a critical role in the development of the nervous system (brain, spinal cord, nerves, eyes). The omega-3’s found in plants (flax, walnuts, chia etc.) are not the same. 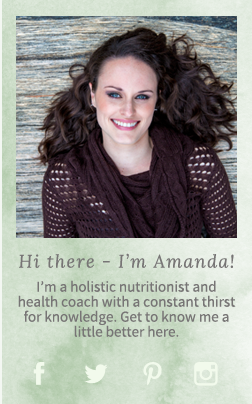 They are a different kind of omega-3 known as ALA. And while we can convert some to the usable form, the amount we can convert is in the range of 1-3% – and that’s with an optimally functioning body, which most people do not have. Which means it would take a cup of flax oil to provide the same health benefits as a few bites of salmon. Fish oil supplements only work in the short term. Once you pass 6 weeks, the benefits peter out. So a supplement will not suffice. So what does that mean? Well, it’s time to start eating fish my friends. Not a fan? At risk of sounding like a total jerk, that’s kind of not an option if you want to make sure you’re hitting your required nutrients. Now I appreciate that some people have fish/seafood allergies, so that definitely is a roadblock, but unless that’s your case, start learning and wanting to develop a taste for it (trust me – I get it. I did not like liver. But I knew how important it was, so I set my mind to it and learned to like it.) If you are in the transition of learning to like fish, or you are allergic, the only other places you can find usable omega-3 fats in are grassfed beef and pastured egg yolks. As with all food, the better the quality, the better the nutrition. For fish you want to try and purchase wild, sustainably caught species whenever possible. That can be challenging to find (and crazy expensive) in the middle of the continent, but luckily demand is going up, so places like Costco (where I get my frozen, wild salmon) are carrying more of this type of product! Though it definitely comes at a price, so you want to make sure you cook it up nicely! 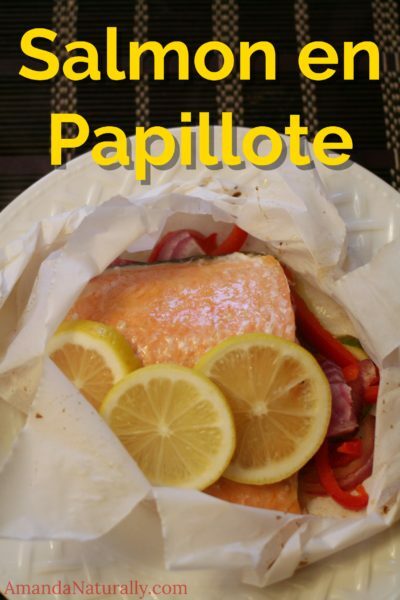 This meal can be pulled together in 15 minutes flat – as long as the fish is thawed. It pairs beautifully with rice (cooked in bone broth of course! ), cauli-rice, steamed potatoes or a simple salad. Aside from being incredibly heathy and the minimal prep/cook time, one of the best features of this meal is it is super scalable. Last night I made it for just me (not too shabby for a solo dinner eh?) and I’ve also made it for a large dinner party. 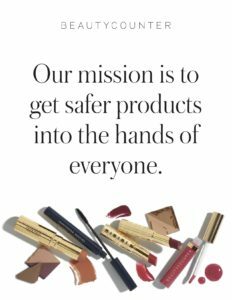 The ingredients are very flexible as well, although I am partial to the ones I use! However if you need to avoid nightshades, simply omit the red peppers and if desired, sub another vegetable like yellow squash or bok choy. Finally, while I made this particular one in the oven, you have the option of using the BBQ as well. We often do that in the summer to keep the house cool! Sounds, looks and tastes fancy - actually super simple! Not to mention delicious and nutritious! 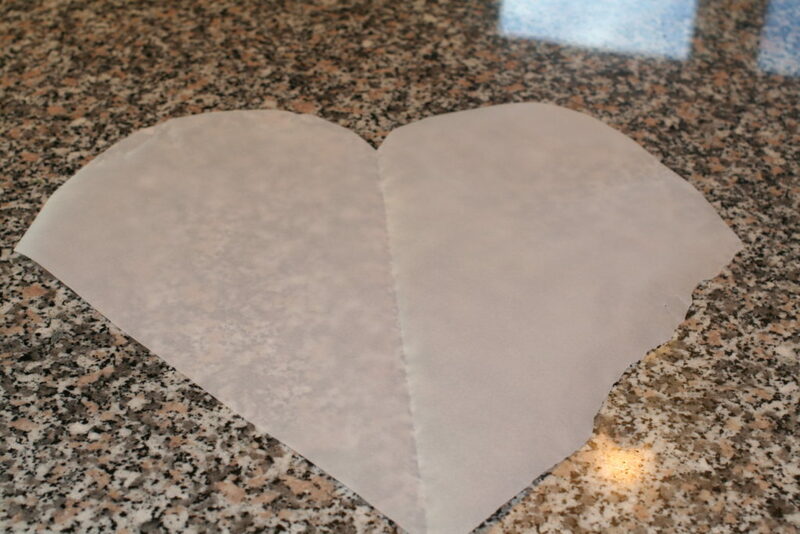 Cut a piece of parchment paper into a heart shape, folded in half. 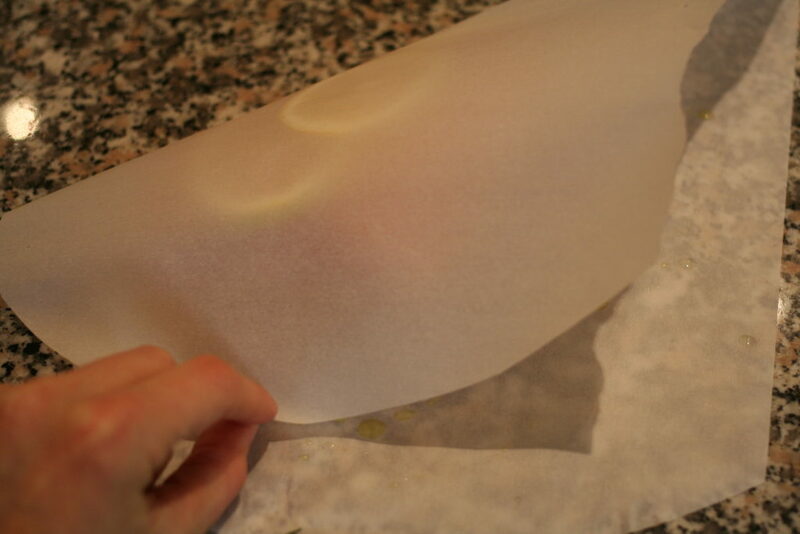 Drizzle a little olive oil under where the salmon will go. Top with zucchini, then onions & peppers. 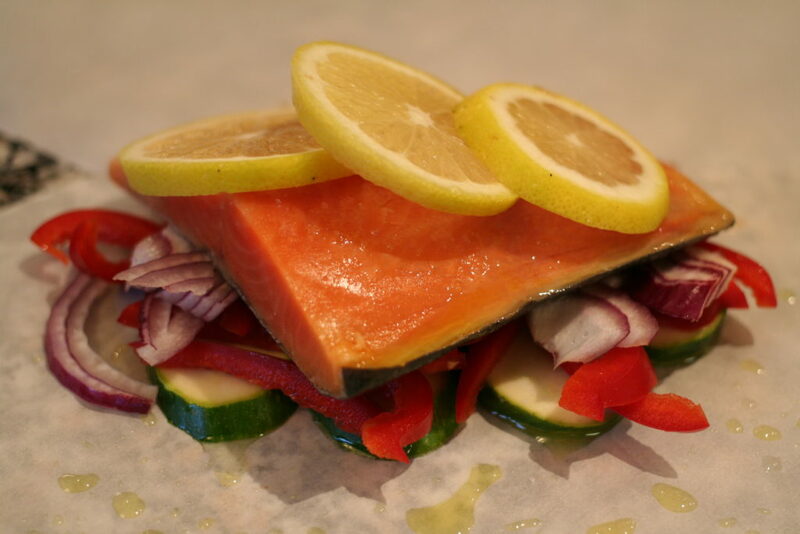 Place salmon on top of veggies. 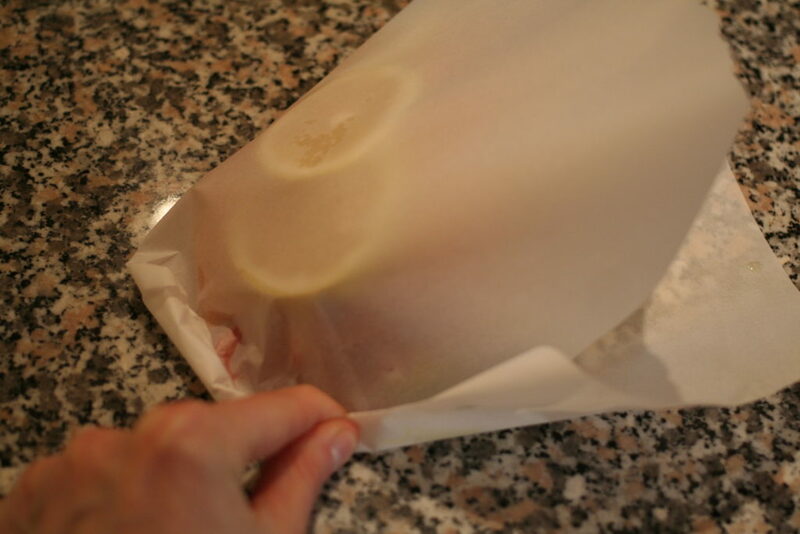 Drizzle with olive oil, squeeze a bit of lemon on top and season with sea salt. Starting at the furthest point away from the point/bottom of the heart, start rolling the edges together, moving all the way to the point. 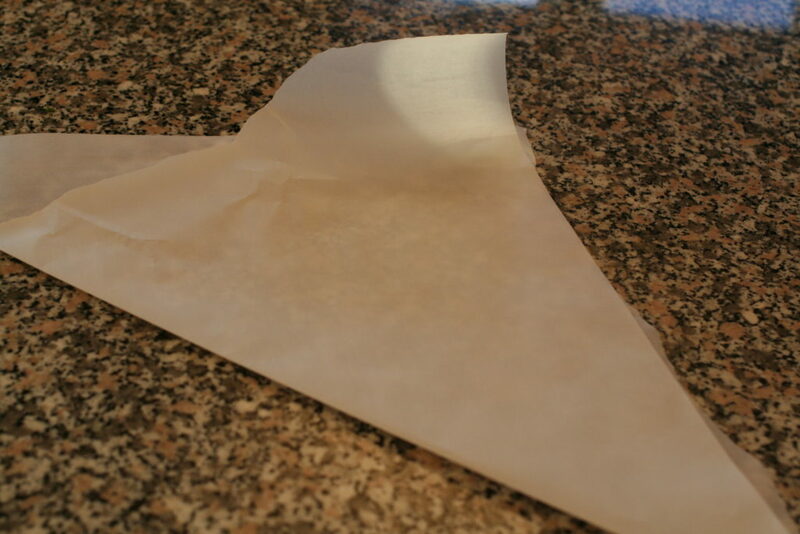 Cut open parchment paper (don't get burned by the steam!) and serve! You can also do the same thing the BBQ. 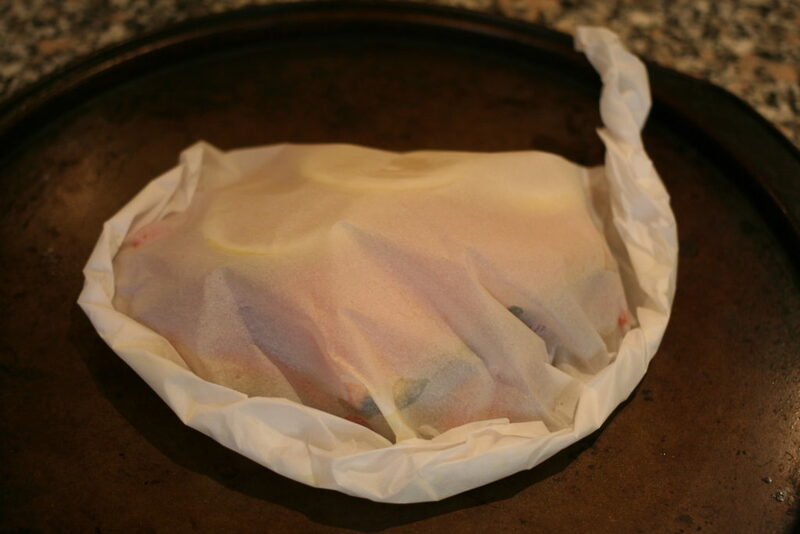 Simply use tin foil (don't worry about the heart/rolling method - just make sure to secure the tin foil tightly) and BBQ at medium high heat for 10 minutes. Scale up for the number of meals you need! For AIP friendly, omit the red peppers. Sub in yellow squash or bok choy. 1. Preheat oven to 400F. 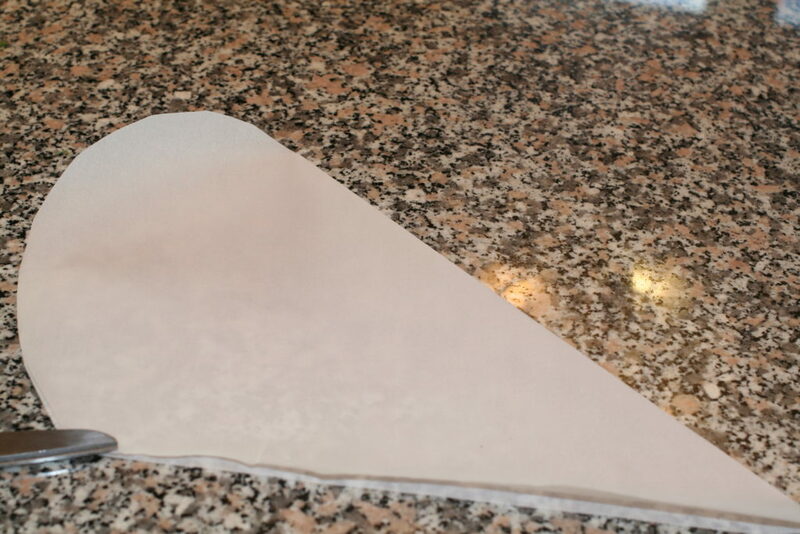 Cut a piece of parchment paper into a heart shape, folded in half. 2. 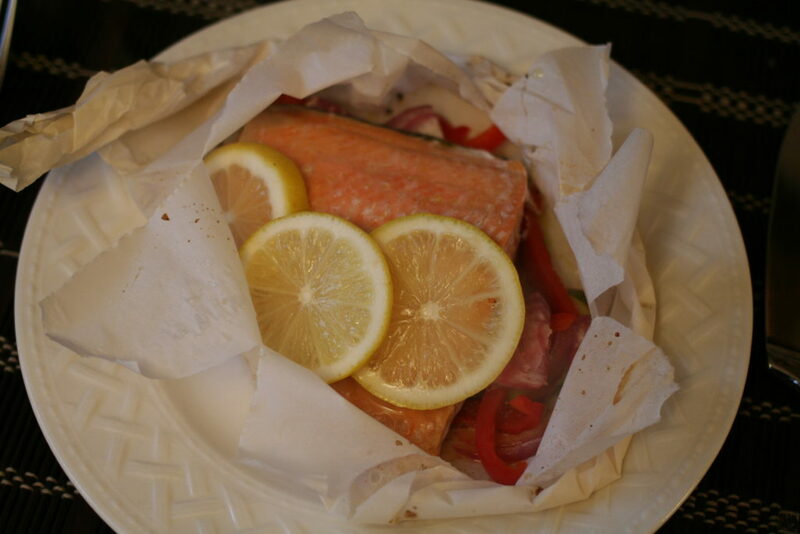 Drizzle a little olive oil under where the salmon will go. 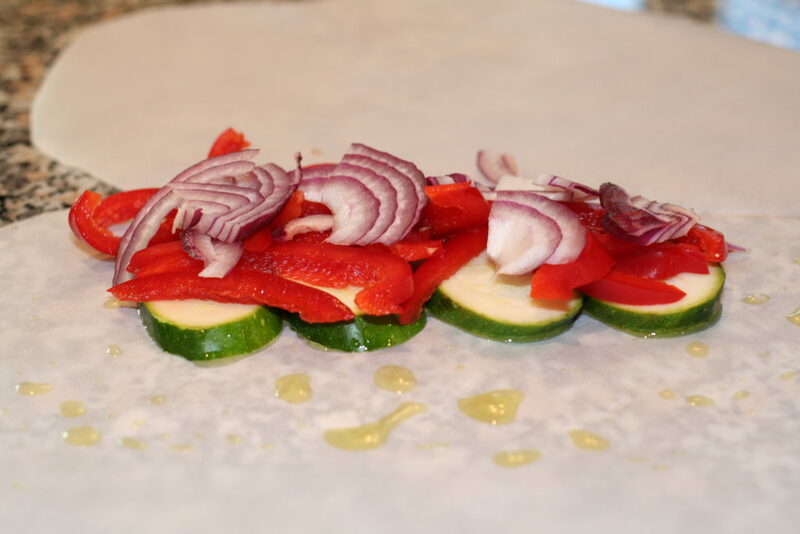 Top with zucchini, then onions & peppers. 3. 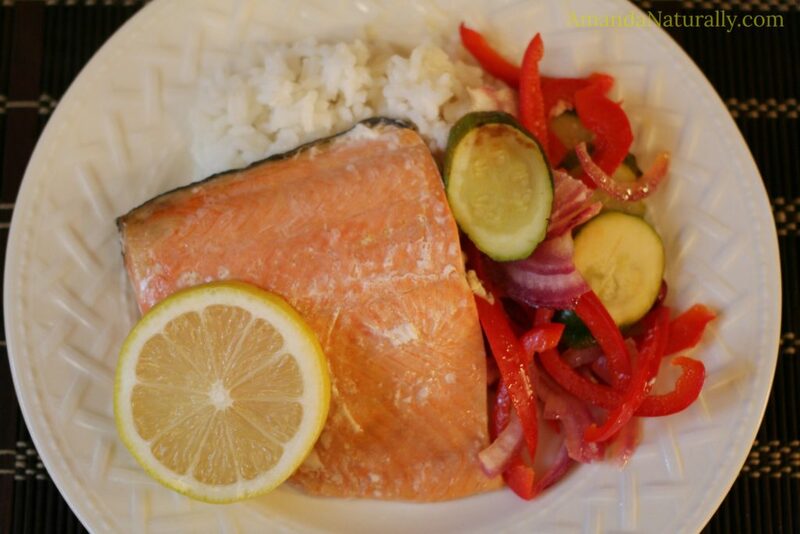 Place salmon on top of veggies. Drizzle with olive oil, squeeze a bit of lemon on top and season with sea salt. 4. Starting at the furthest point away from the point/bottom of the heart, start rolling the edges together, moving all the way to the point. Bake for 10 minutes. 5. 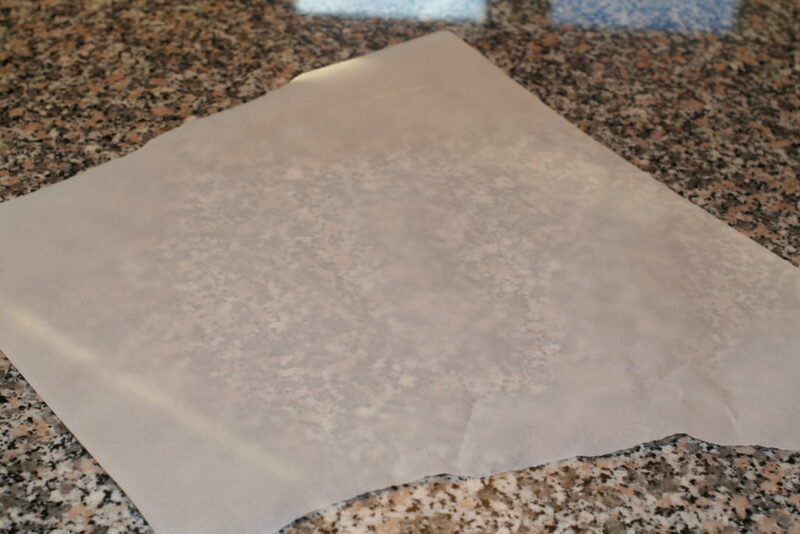 Cut open parchment paper (don’t get burned by the steam!) and serve!